“Three Identical Strangers” is the best documentary thus far in 2018 and one of the best overall films of the year. The well-deserved recipient of a U.S. Documentary Special Jury Prize for storytelling at the 2018 Sundance Film Festival, “Strangers” is a compelling work that is thoughtful, compelling, moving and leaves a lasting impression for many moons after the credits have faded to black. Even though it’s been 38 years since long lost triplets miraculously reunited, it remains a story with ripple effects being felt to this very day. 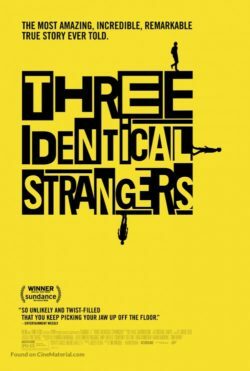 Initially, “Strangers” reels us in with an infectious enthusiasm we feel radiating from Robert “Bobby” Shafran who describes with a gregarious smile how he stumbled upon his identical twin brother, Edward “Eddy” Galland. Their reunion made headlines across the country, but it became even crazier when a third brother, David Kellman saw doubles of himself in a newspaper. The triplets became overnight sensations and appeared on a multitude of media outlets at a blistering pace, which was only matched by their wild partying. Both David and Bobby recount those days, as well as how they started families, with great fondness. However, things start to take dark turn as “Strangers” begins to develop a grittier, tragic tone with its probe into how they were separated in the first place. As it turns out, the triplets improbable, 1980 reunion in New York set a series of disturbing events in motion that began with a negative meeting between the brothers’ angry parents, who were upset their sons had been intentionally split apart, and an adoption agency with some shadowy backers. It’s paired with an author/journalist in Texas who uncovers a secret study that, as David describes, turned the brothers into lab rats. The sinister background to it all begins with late child psychiatrist and psychoanalyst Dr. Peter Neubauer (1913-2008). Neubauer was an Austrian Jew who was able to escape his Nazi-controlled country by fleeing into neutral Switzerland where he completed his training before moving in 1941 to New York City. It sounds heroic enough until we learn that like the Nazis he fled from, Neubauer initiated an inhuman, concentration camp-like experiment by orchestrating a program in which several sets of twins and one set of triplets, the brothers in “Strangers,” were deliberately separated during infancy as part of a clandestine “nature vs. nurture” experiment. Even more shocking is that it was the Jewish Board of Family and Children’s Services who helped Neubauer with a program that led to a variety of mental health issues among its unwitting participants as they entered adulthood. Naturally, Bobby and David, among others, continually try to demand answers, but he ended the program in 1980, Neubauer, realizing his work would be controversial, had his study sealed upon his death at Yale University until the year 2066, thus insuring its participants would be dead by the time its findings would be released to the public. “Strangers” is a superb example of documentary filmmaking as it entertains, educates and causes thought provoking discussion of the subject matter. All of director Tim Wardle’s interview subjects are engrossing to listen to and his overall storytelling flows naturally like winding stream. His work shines a light on a dark tragedy that almost disappeared into the shadows. This is a film that should not be missed.